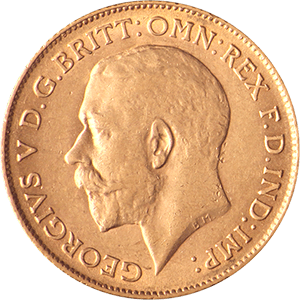 The George V Sovereign was first released after the death of his father Edward VII in 1910. The King’s reign coincided with great political changes globally, with the rise of Communism, Fascism and freedom movements across many of the colonies. As such the monarch represented something of a stable figurehead through the First World War onwards. The coin itself is of high purity, 22 carats, and is extremely popular with collectors and investors alike. Many of the pre-war coins tended to be heavily marked due to widespread use, few people could afford collections in time of war, and so the value of the coin is subject to its condition. The Sovereign’s face value is £1, but it’s gold content alone means it is worth far more in today’s market, Add to this the historical value and high collectability and the coin has proved to be reliable investment. 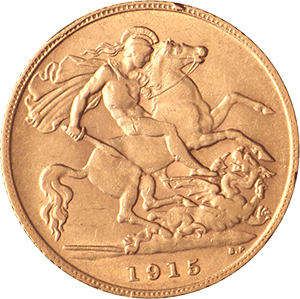 The George V Sovereign has a gold content of 0.2354oz and weighs 7.98g. It’s diameter measures 22.05mm and it has a thickness of 1.52mm. Almost all Sovereigns have milled edges, but there are some highly valuable exceptions with flat edges that were manufactured in error and accidentally released. The Sovereign itself is one of the world’s oldest coins with roots going back to the 15th century and the reign of Henry VII. Since the early 19th century, the Sovereign has carried Benedetto Pistrucci’s George and Dragon design on the inverse. Such was the complexity of the design that The Royal Mint was unable to reproduce it from the original design and Pistrucci had to undertake the engraving of the dies himself. The George V Sovereign is capital gains tax exempt. Goldinvestments.co.uk are one of the most experienced gold vendors in the UK and all our products are well described and verified by the relevant authorities.